What Animal Would Eat Rhubarb Out of the Garden? Rhubarb stalks contain oxalic acid, which is toxic when eaten in large amounts. Most animals avoid rhubarb, but hungry animals will eat almost anything. Use a process of elimination to identify the animal eating your rhubarb and then take action to protect young, tender stalks. Plant rhubarb in full sun for best growth. 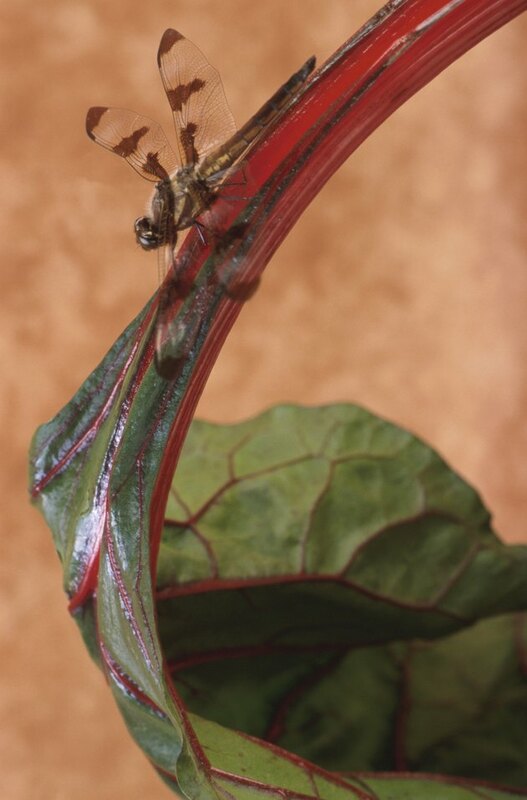 Rhubarb doesn't have a lot of insect pests, but the two most common ones are rhubarb curculio, or rusty snout beetle, and slugs. Black spots on the stems of the plants indicate rhubarb curcolio; jagged holes indicate slug or snail activity. Control the beetles with rotenone or pick them off by hand. Set out slug traps if slugs are destroying the rhubarb. Deer are the most likely grazers and will eat rhubarb down to the ground. They generally only bother the rhubarb in the early spring, when other food sources are scarce. Raccoons may also occasionally eat rhubarb. Cows and sheep will graze on wild rhubarb in fields, but in a home landscape, this shouldn't be a problem. The simplest way to keep marauding deer and raccoons out of the rhubarb is to build a wooden frame that fits over the rhubarb plant. Cover the frame with 1/2 inch chicken wire. Secure the frame at the base with landscaping pins so the deer can't knock it over. Other options include commercial deer repellents or scare tactics, like motion-sensing lights. A protective family dog can also deter pests. Symptoms of rhubarb poisoning in grazing animals include diarrhea, depression, trembling, and drinking and urinating more frequently. Animals are rarely poisoned by consuming small amounts of leaves, but in large amounts, rhubarb leaves can cause kidney failure and even death. Ensure that young children and household pets don't consume the leaves. Do Deer Eat Knock Out Roses?